Captivating the world of electronic music with their incomparable sound and otherworldly journey of music, DJ/Production duo Vini Vici strike dance fan’s souls like none other. Hailing from Israel, Aviram Saharai & Matan Kadosh are sweeping the globe with their transcendent musical genius and atmospheric live performances. 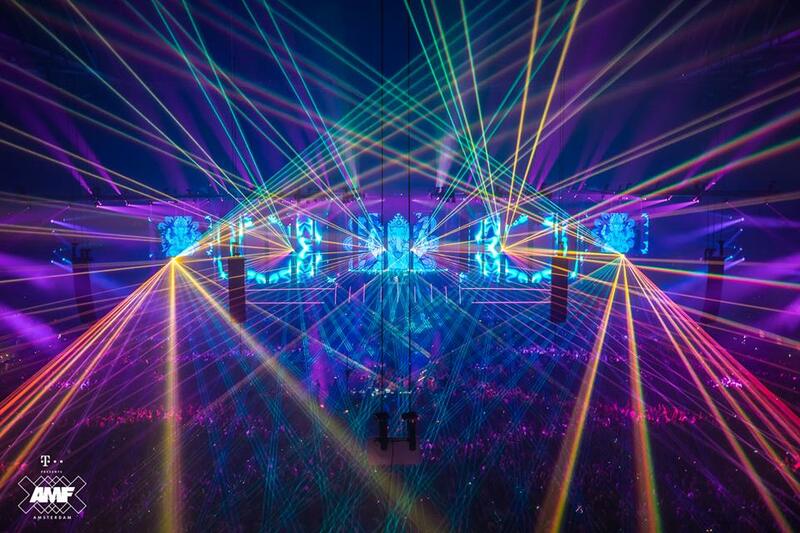 This year’s Amsterdam Dance Event (ADE) was in high anticipation of the duo’s set for Saturday night’s Amsterdam Music Festival at the Johan Cruijff ArenA. To say Vini Vici left this crowd of thousands entirely speechless and on an emotive dance high would be quite an understatement. AMF 2018 marked an especially rewarding performance for the pair, as this was the first time they each had the honor of their families experiencing this mega set with them. Different than many production duos in the scene, Vini Vici often do not play side-by-side at their live shows. Compared to tackling shows and festivals solo, coming together on stage certainly creates a different and mesmerizing dynamic. From front to back and left to right, the two projected nothing but raw energy and unparalleled hype unto AMF. Dishing out a roster of heavy hitters, Vini Vici’s set progressed with songs like “Free Tibet,” “The Tribe,” “United,” “Chakra,” Tiesto’s “Boom,” just to name a few. And, lest we forget when the crowd went absolutely mental for an epic sit down to none other than their collaboration track “Great Spirit” with Armin van Buuren and Hilight Tribe. Unleashing a delightfully pure dose of Vini Vici, Saharai and Kadosh continuously send crowds into alternate dimensions of time, space, and music. AMF truly wouldn’t have been the spectacle of sound it was without Vini Vici this year, as the two literally leave fans chanting and begging for more, and eagerly awaiting their next chance to experience a night with the psychedelic music masters. We were psyched to have a chat with Vini Vici just before they took the stage at AMF in the wee hours. Check out what they had to say about ADE, tour life, their one-of-a-kind sound, and why this performance was so extra special below! Nocturnal Times: Welcome to AMF, and congratulations on winning the #34 spot in DJ Mag! How does it feel to be here on this big night? Vini Vici: Yes! We decided to take it easy so we just got here today. We let our management do the boring work, but we have a special thing tonight actually. We brought our parents from Israel to see us perform for the very first time. So it’s very exciting you know! Because deep inside every kid just wants to see his parents proud. So this is the most exciting part of the evening for us. Nocturnal Times: Earlier today you played at SLAM! Radio – tell us about how the set went! Vini Vici: Well it was a lot of fun I can say! Very cool production of the radio show. We know in fact it’s one of the biggest radio stations of Amsterdam, of Holland. It was a very nice experience – it’s kind of hard to play in a studio for yourself, but still it’s very nice. Also we just landed and we slept like 15 minutes, so we’re very tired. You see the red bull here…we did our best! Nocturnal Times: Do you have anything going on here in Amsterdam tomorrow? Vini Vici: Tomorrow we’ll take the day off and spend quality time with our parents. It’s very important to balance between the DJ life and the normal life. It’s not easy. We landed today, slept 15 minutes, go do a radio show, go to the DJ Mag dinner, now we come here and do interviews so it’s really important to balance. Nocturnal Times: Speaking of that balance, you guys often don’t play together. How do you go about balancing your time together and apart? Vini Vici: Well me and Aviram go way back, and it’s fun because our phone is always on and we talk together for hours, like eating, showering…the phone’s there. Sometimes even if I don’t see him for one month I feel like I saw him yesterday. Nocturnal Times: Thinking back on sets or cities you have played together, what have been some that stand out? Vini Vici: Definitely one of them this year was Tomorrowland. EDC Vegas was awesome. They were a few dreams that became true, and we were really flattered. A State of Trance, the Main Stage. Sometimes to perform on these stages is a natural high. It’s like you go back to the hotel buzzing. You close your eyes and see fireworks! Nocturnal Times: Tell us about some of the collaborations/ releases you’ve worked on this year, as we know you’ve had some exciting ones! Vini Vici: Yeah we did the one with Dimi & Mike, with Timmy Trumpet, Steve Aoki, Armin, Alok & Zafrir, and Astrix which is a psytrance legend. So these are the ones we did – there’s a few coming but we can’t share yet because things change! But after the busy Summer we had, we got quality studio time these months and we produced some new music, and the muse are on fire! Actually, we feel that our muse is a bit blocked by over-muse. We have like 10 ideas we want to do and we don’t know which one to do before the other! Nocturnal Times: Your sound is very one of a kind and easily recognizable. How did you come to develop this, or who did you learn from? What influences or mentors have you had? Vini Vici: Our major influence is that we are Israeli. We were born in a country where psytrance culture is based in the DNA of Israeli. When you grow as a kid, the immediate thing that you will learn and listen to if you like electronic music is psytrance. I remember at the age of 14-15 I fell in love with the sound and it immediately affects you. It got inside of our mind and our muse, it immediately leaves psytrance in our head. We love a lot more electronic music, so the balance between psytrance and more electronic music, that’s probably the mix of Vini Vici, and that’s why we have this kind of unique sound. Nocturnal Times: Your wildly successful anthem “Great Spirit” with Armin and Hilight Tribe is certainly a beast of its own and a perfect representation of that sound. Being part of so many crowds during this song live, we’ve noticed there are not many other tracks that get a crowd going quite like this one. How did you create this work of genius? Vini Vici: I think it’s important that the last few years the main thing was like bigroom EDM, and every DJ that was coming up was using the same sound, the same preset, and people got bored of it. I think we fell in the gap with something new – a new sound, new idea, something like you said that stands out. I think now the scene is more open, and not only for psytrance but also for hardstyle and some trap, techno. It’s a mixture of a lot of genres and I think if I was in the crowd I would prefer something like this when you come and hear a variety of stuff and are exposed to new music. It’s better than just to hear the same stuff all over again. Nocturnal Times: After being in the industry for some time now and having established your name, what are one or a few things you’ve seen develop and change over the years that you really like or think are cool? Vini Vici: We come from the psytrance scene so it’s different. Everything is new for us now. We come from the woods a few years back, from very underground parties. 500 people underground parties, and step by step, no shortcuts we got ourselves to the top of the industry. So we don’t know too much about behind the scene on like the global EDM side. We start to know, start to hear gossip and stuff but you know if I don’t have anything good to say I prefer not to say it! The thing that also happened this year to Avicii, and a lot of artists that have just collapsed and took a step down, it gave us a stronger feeling to do the balance between the normal life with our families and the DJ life. So that’s something that we really learned this year like to really try to keep it separate. I think that’s something that a lot of DJs need to learn because what happened to Avicii is something we can’t let happen again. The people that reach the Top 100 or the top of this industry are people that are normally always pushing forward with all their power. We are as well like this, like we work when we sleep and tour all the time so it’s really important to balance your health. Nocturnal Times: And lastly before we go, what is coming up from you in the last few months of the year, and into 2019? Vini Vici: Well, Summer was crazy but we had some free studio time lately so we did a lot of new music, new mashups, and it’s really demanding but we are always trying and pushing forward. We sit in the studio and say, no it’s not enough! We need something else new, something else new. We need to change. So a lot of new music, a lot of new edits, so we hope people like it! Featured photos via Vini Vici and AMF Facebook. Caroline is an avid electronic music enthusiast. Born and raised in the Boston area, Caroline relocated to New York and then again to Florida to complete her Bachelors Degree in Social Entrepreneurship & Business. First attending Wagner College in Staten Island, she transferred to Rollins College in Orlando. Her passion for EDM and music festivals has taken her up and down the East coast, and inspired her to pursue her dreams within the industry. Electronic music truly has been a blessing in her life, and landed her on a path she is sure is her life calling.